The Equal Justice Initiative's Memorial for Peace and Justice, in Montgomery, Ala.
BROOKE GLADSTONE: This is On the Media. I'm Brooke Gladstone. Montgomery marks its history, and though most of the signage in granite is devoted to the Confederacy, more recent events increasingly intrude. Take the intersection of Dexter Court and Commerce. There’s a telegraph office where, in 1861, General P.G.T. Beauregard was authorized to attack Fort Sumter and launch the Civil War. Across from that is the bus stop where Rosa Parks boarded her bus and took the fateful seat she refused to surrender in 1955. At the intersection’s heart is the artesian basin fountain, site of a slave market, marked with a sign. Slaves of all ages were auctioned, along with land and livestock, standing in line to be inspected. Public posters advertised sales and included gender, approximate age, first name (slaves didn't have last names), skill, price, complexion and owner's name. In the 1850s, able field hands brought $1500, skilled artisans 3,000. ALANA CASANOVA-BURGESS: That’s Lee Street over there. BROOKE GLADSTONE: Of course, our ultimate destination is the Equal Justice Initiative’s Legacy Museum, from enslavement to mass incarceration. On the way, we meet another museum goer. ALANA CASANOVA-BURGESS: Where are you from? WOMAN: Right now I’m from Georgia. My husband is Air Force and he’s teaching at the Air Force base right now. WOMAN: So I’m, I’m just tooling around. I was going to this Rosa Parks Museum this morning, walked around the corner and the security guard there -- you know, I was just looking at the building and she said, did you see the poem on the side of the building? ALANA CASANOVA-BURGESS: What is the poem? WOMAN: History, despite its wrenching pain, cannot be unlived, and if faced with courage, not need be lived again. ALANA CASANOVA-BURGESS: Who wrote it? WOMAN: So then she took my picture in front of The Legacy Museum, That’s the one you’re talking about? WOMAN: I want to go to that. I got to do that, at least, because it says something about, oh, the injustice and the lynchings that happened after the abolition of slavery. WOMAN: And I’m, like, what? Up until 1950. I’m a skeptical person that feels I can’t believe everything that I read, see, hear but, you know, you can hear it, at least. I mean, you can take in the history lessons, you know, and that’s where each person has to weigh the evidence that they see. And, and it’s not like I’m looking to be persuaded or not be persuaded. Injustice happened, for sure. That’s why I took a picture of that poem. For sure, we don’t need to relive it. BROOKE GLADSTONE: I was surprised by her skepticism about the persistence of lynching, since photographs are easily found, and the one of Emmett Till's body in 1955 is historic, having galvanized the civil rights movement. But Bryan Stevenson wasn’t surprised. BRYAN STEVENSON: That’s not an uncommon perspective. Most people can't tell you anything about slavery, ‘cause they don't know that there were 4 million enslaved people living in this country when the Civil War began. They certainly don't understand that the great evil of American slavery wasn't involuntary servitude and forced labor, it was this ideology of white supremacy, this narrative of racial difference. And for me, that's the narrative that we haven't actually come to grips with, this notion that black people aren't fully human. That was the true toxin that poisoned our nation. BROOKE GLADSTONE: He wants The Legacy Museum to connect the dots, to show how the evolution of the slave market made slaves even more vulnerable and emboldened the owner who depended on them to treat them less and less as human beings and to convey the humanity of the slaves, the anguish you’d think anyone could imagine. But why would we, really? BRYAN STEVENSON: We banned the international slave trade in 1808, which is actually before Alabama was a state, before Mississippi was a state, before Louisiana was a state, before the Deep South had actually formed. A million enslaved people were moved from the North to the South where enslaved people were losing their value with increasing calls for abolition. Slave owners didn’t want to be caught owning property that they could not get a return on, and so they wanted to trade that to a region where there were people still willing to buy. And that created the domestic slave trading that became so especially brutal. That’s what separated children from, from mothers and families were broken up, etc., and it was harder labor. BROOKE GLADSTONE: Once in the Museum, Alana and I were struck immediately by holographic images of people in cells, slaves glowing with their own light and speaking of loss. WOMAN’S VOICE: Can you see my children? It seems like I hear my daughter calling out for me but I, I can’t find her. 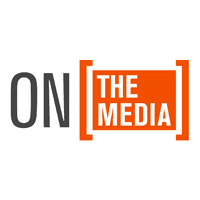 BRYAN STEVENSON: And we want them to have a first-person narrative. MAN’S VOICE: She fell at his feet, clung to his knees, entreating me to buy a baby, as well as his son. BRYAN STEVENSON: We employ this technology that shows you the slave pens where people are held, and then the ghosts of these enslaved people emerge. And we use actual slave narratives that people recite. and handcuffs. When they take us out on the block and want us to sell ourselves, don’t be silly. Praise yourself or you’ll surely be beaten. BRYAN STEVENSON: You know, we’ve heard spirituals and you can go to the most ornate concert halls, these songs have become part of the canon but it’s only when you hear a spiritual being sung by an enslaved person enchained in a slave pen, it’s only when you hear someone singing in that setting that you begin to understand the grief and anguish that produce this music. WOMAN SINGING: This slave is alive. She said, “My back has been beaten many times but has always healed. They sold my husband away, my heart is not right yet.” Until you have a perspective on what it means to be ripped from the only thing you get as an enslaved person, which is the opportunity to love someone, your child, your spouse, your parents, then you're not going to appreciate the devastation. And then when you see that instead of remedying 250 years of enslavement, we actually aggravate it by terrorizing people through lynching, and we try to make that tangible. When you go into our Museum you see jars of soil. The community groups have gone to lynching sites and collected soil and put it in jars with the names and places of these lynchings. Because we’ve made that history invisible, we want to make it tangible. ALANA CASANOVA-BURGESS: It’s Robert Louis in Port Jervis, New York, June 2nd 1892, Mary Jackson, Harrison County, Texas, February 13th 1912. You’ve got Georgia, Colorado, Kentucky. WOMAN’S VOICE: -- are gathered to watch as John Hopfield was hung from a tree. As he swung, his fingers were amputated and passed around as souvenirs while he screamed in pain. The car that shot over 2,000 bullets to his body until a final bullet severed the rope dropping his body to the ground where he was burned in the spot. Postcards of the proceedings were sold for 20 cents to those wishing to commemorate the day. BRYAN STEVENSON: I have argued that slavery didn’t end in 1865, it just evolved. It turned into decades of terrorism and violence where black people were pulled out of their homes, they were drowned, they were hanged, they were beaten. And everybody was complicit, the courts, law enforcement, elected officials. Churches, teachers, schools would all come out and celebrate these acts of torture. And it was so traumatizing that 6 million black people fled the American South. It was one of the largest mass migrations in world history, and we haven't talked about that because I don't think that the black people in Cleveland, in Chicago, in Detroit, in LA and Oakland went there as immigrants looking for opportunities. They went there as refugees and exiles from terror. And the generational poverty we see in those communities, the, the consequences of being displaced from land and the opportunity to develop wealth is still evident. And rather than acknowledge this role of terror and lynching in creating this reality, we blame these communities. I mean, you had at the end of the 19th century, hundreds of thousands of formerly-enslaved black people who had skills and trades and had the ability to create wealth through agriculture, through industry, but they weren't allowed to do that because their lives were menaced whenever they became too successful. And so, this wealth gap that we talk about in America can't be understood until you understand the way in which we used terror and violence to prevent wealth accumulation in the African-American community. And then displacement aggravated that and then we blocked black veterans and others from entering the middle class through redlining and denying them loans and economic opportunities. And I think the galling part for many people is that they hear folks now saying that we’re dealing with domestic terrorism for the first time in our nation's history after 9/11. And for older people of color that's an insult, it's an added injury because they grew up with terror. And that’s why these narratives of lynching become so important. People weren’t lynched just because they were accused of some violent crime. They were lynched because they were successful in business. They were lynched because they insisted on being treated fairly. When they asked for better wages as sharecroppers, they would be lynched. When they asked for better conditions as coal miners, they would be lynched. When a black man got too close to a white woman, he would be lynched. When a black woman complained about her husband being lynched as being unjust, she would be lynched. And this violence was intended to sustain racial hierarchy. And our complete absence of awareness contributes to this false narrative, this false understanding of who we are. Changing that, for me, is key. If we understood that we did horrific things to enslave black people -- we, we tortured them, we raped them, we had children taken from their parents -- and we promised freedom after emancipation and what we gave instead was terrorism. BROOKE GLADSTONE: It’s a short walk from the Museum to EJI’s National Memorial for Peace and Justice, the lynching memorial. 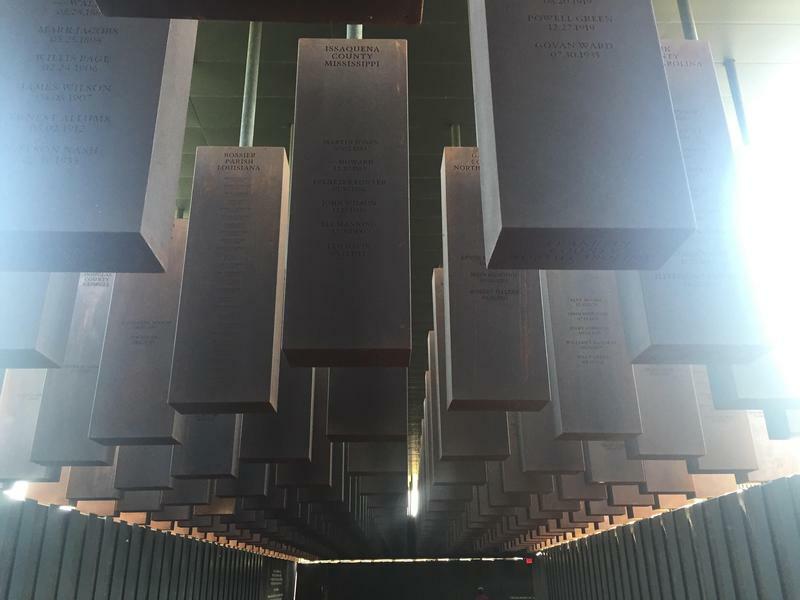 Every lynching, when it is known, every county, every date, every name is engraved on copper columns suspended from poles, higher and higher as you proceed through the site, so many. This is very much like the memorial in Berlin. I mean, it's different because it looks like, in Berlin, a bunch of tombstones, tall and short and short and tall on a hill and down. That seemed to represent men, women and children. And, and here, they’re suspended on poles and so it definitely gives you the impression of hanging. ALANA CASANOVA-BURGESS: -- Georgia. And the first date is 1894 and then the next four all have the same last name, Paget, Docia, Sam, Sula and Wilfred. [?] And they all were lynched on the same day, May 21st 1907. And I think that tells you as much a story as, as anything here and that these people were killed as a group. This family was exterminated. BROOKE GLADSTONE: Henry Smith, 17, lynched in Paris, Texas. WOMAN: Oh, there’s Kettle Parish. Oh my god. BROOKE GLADSTONE: Is that where you’re from? WOMAN: That’s where I was born. WOMAN: You see a White on there? WOMAN: And this is the first one, I think, out of Kettle. ALANA CASANOVA-BURGESS: From this angle, right, we have to stretch our necks up. It puts you under their bodies in the same way that a mob would be. BROOKE GLADSTONE: I wonder if you want to create a sense of complicity. BRYAN STEVENSON: Yeah, I don’t think there’s any question. I mean, when you go to Brandenburg Gate and you see the Holocaust Memorial, you are trusted to bring into that space an understanding of the Holocaust that will allow you to have a meaningful interaction with those wordless structures. In America, we could not create a memorial with no words because people don't have an understanding of this history. And so, when you walk into our memorial, you walk down a path where we narrate this past. And we have to remind people about the enslavement that proceeds, and that's why we have that slavery sculpture by Kwame Akoto-Bamfo. And for many people it’s the first time they’ve ever seen a sculpture with human beings about slavery. That’s how silent we have been. BROOKE GLADSTONE: It depicts human suffering in exquisite detail, as one viewer observed. WOMAN: Look at the feet. Look at the hands. Look at the, the creases in the -- I have a much larger vocabulary but I am still so overwhelmed. [LAUGHS] I can’t say anything else. BRYAN STEVENSON: The figures are in chains. You see a mother holding a baby. BROOKE GLADSTONE: And then you see an empty pair of shackles lying on the ground and there a story is told. BRYAN STEVENSON: That reflects the 2 million kidnapped people who died during that slave trade. But, but what he also presents with these figures that are streaked, the copper streaks down them, you see their anguish and pain but you also see their humanity, their dignity. The name of that installation is called Nkyinkyim, which is from an African proverb that talks about resilience and resistance to oppression. And then you walk in to the monuments. Our country has been largely silent, and so it hangs over us. It is a cloud, it’s a shadow that continues to haunt us. And as those columns begin to rise, they’re lifted up, one, because that's what racial terror lynchings were about. They wanted to lift up these bodies because they wanted to torment communities of color. And that terror can't be understood without replicating those dynamics, and so we lift them up because, unlike the nation state of Germany, we have not been willing to talk about this history. We are a small private organization creating a space for this story to be told and until that story is acknowledged and other institutions and people reckon with this history, it will continue to haunt us. And we give people the opportunity, if we have a replica for each one of those monuments in the park, and we are asking people in communities to have these conversations and to claim their monument. BROOKE GLADSTONE: How many counties across the nation? BRYAN STEVENSON: There are about 840. BROOKE GLADSTONE: How many states? BRYAN STEVENSON: About 29 states. BROOKE GLADSTONE: What you’re asking is for counties to own their histories, basically put this replica of what you have in the Museum in the location where the lynching took place. BRYAN STEVENSON: Right. I do think there is something about sites of conscience, about places where horrific things happen. There’s a reason why people go to Anne Frank's house, there’s a reason why we have a 9/11 Memorial. Less than 15 years after 9/11, we wanted to create something to make future generations understand the agony of that moment. We do believe in memorials, we just haven’t been willing to memorialize the most tragic and devastating aspects of our history that relate to lynching and slavery and segregation. And so, yes, I think the monuments create an opportunity for communities to begin a process of recovery, of reconciliation, of restoration. But they will be there and if the communities don't engage, the monument becomes a sort of report card, which communities have claimed their history and which ones haven't. BROOKE GLADSTONE: That whole section where the replicas lay you hope one day will be empty. BRYAN STEVENSON: That’s the hope and that there’ll be information about every county in this country that did something in response to that sense of dread and menace that people experience when they walk through the Memorial. BROOKE GLADSTONE: The Memorial is the experience I'll take home with me, the one I'll never forget. It felt elemental and real. The columns had names and places and they forced me to look up and up and up. The replicas, the twin columns, which all those counties are called upon to claim, along with their dark history and acknowledgment of the annihilated, including in my state of New York, I hope they are claimed. They must be claimed. MALE LISTENER: Hi, so I live here in Austin, Texas and recently people have decided to change the name of some streets that might have been named after Robert E. Lee. And I think it’s very funny because if there’s a move to get rid of Confederate names here in Austin and in Texas, then they’re gonna need to get rid of all the Texas history names, including Austin named after Stephen F. Austin who was a slaveholder, Travis named -- Travis County named after William Travis who was a slave owner and, and Houston, of course, also named after Sam Houston who was a slave owner. So that’s what’s funny.